Most recently I have frequented artistic events that have not made use of a paintbrush but a pen and typeface as mode of choice to execute one’s creativity. 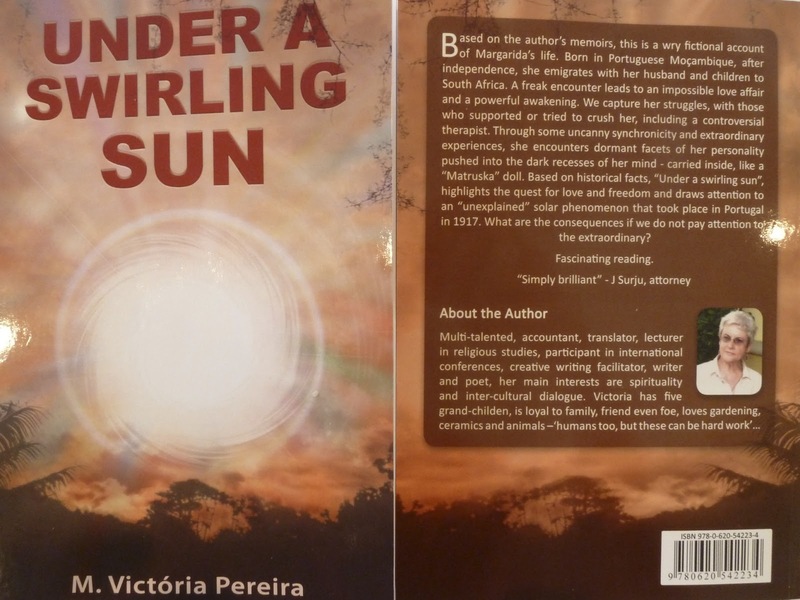 My mother launched her new novel called UNDER A SWIRLING SON by Victoria Pereira. Based on mémoirs, this novel is a wry fictional account of Margarida’s life, which highlights the struggle for love and freedom, the mystery of synchronicity and the breaking of psychic boundaries. It also zooms into an extraordinary solar phenomenon, seen by thousands, which took place in 1917. What are the consequences if we don’t pay attention to the extraordinary? Most recently I have frequented artistic events that have not made use of a paintbrush but a pen and typeface as mode of choice to execute one’s creativity. My mother’s debut novel, UNDER A SWIRLING SON was launched on the 28th by Adams Bookshop and Reach Publishers. Cedric Sessing, of Adams Bookshop made use of the local Portuguese church, San Jose on Argyle Road, Durban, to promote this event as being now the Christmas season, it could not be done at their Musgrave Branch. Quite appropriate, as this church is part of the author’s community with whom she has been actively involved for perhaps two decades. Indeed, amongst the crowd was the Portuguese Honorarium Consul in Durban, Mr Elias Sousa and his wife Julia. He ended the speeches by thanking Victoria in name of the Portuguese, for her achievements. This book can be purchased via victoria-pereira-poet.blogspot.com and soon will be on e. kindle. One of the invited guests expressed her admiration towards my mother and I acknowledged that. Indeed, I recall many a letter or assignment written during my school years that underwent intense scrutiny before being handed in. For someone who speaks with a strong portuguese accent and came from Mozambique only in her 40’s , my mother has a great command of the English language. Victoria has run creative writing workshops and two of her poems were selected by the Speech and Drama Association of South Africa for the National Syllabus 2011-2013. Recently, she was the invited Guest Poet at the Live Poets’ Society, headed by Danny Naicker and Brett Beilles. Another great evening, with poetry being read, savoured and appreciated by many, within the inspiring atmosphere of the Point Yacht Club where the group meet on a monthly basis. Some of the readers were Danny, Brett and Hannah Lurie .